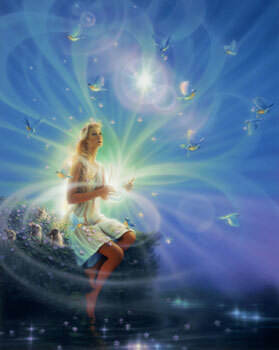 Immensely powerful and uplifting energies of change are flooding in, and bringing in awakening on a very deep level. It is not only the awakening to much higher degree of consciousness, but also the awakening of what has lain dormant, been sealed off to humanity, after the Fall of Atlantis, the last of those civilization which came before us, and self-destructed. I was called upon to massive energy work today, and with it came the releasing of so much of old. The new waves of cosmic energy entering now, are reminded us of our own soul, and thus our own infinite link to the Greater Whole. So, many of us are old souls who have been here time and again. So many of us are in our last incarnation on planet earth, and many of the soul group members have incarnated, to make their final stage call, and thus to truly work through those old negative karmic patterns, and finally free themselves up, as soul lessons are mastered. It is time to let go: – of all the old stuck baggage, all that unforgiveness, all those grudges, all that is holding you back, and what you are holding onto for dear life. The more we let go, the freer we become, the more our consciousness levels rise. Once you are freed up, and find that love indeed is there, deep within you, and claim your true son- and daughtership of God, you cannot but arise from the dead. The dead in this case, is the old Adam and Eve, the old you. We all go through stages where we have to die onto the old, in order to be reborn. As I was doing the energy work today, and saw how the area of the world I was called upon to work at, had that specific ancient site release, how huge black cloud rose, of all the souls who were stuck there – some for millions of years. As they were freed the angels gathered them and put them into the fires of transmutation, were their souls were freed to finally to home to their home galaxies, and be freed. So much rejoicing in heaven and earth when this happens, for in truth, when we return to our true home, our own immortal Being, we are so filled with Light and Love, that we truly do not wish to shackled and chained to the old which no longer serves us. Embrace this moment, for you are being given a window of opportunity this weekend, to truly break free from all that has been blocking and hindering you, and break through into the higher and much more empowered SOUL YOU and be reborn into a much more light- and loved- filled Being, while here on earth. One of the harder aspects to the mission I’ve been on, is the feedback of the lie, the resonant memory of a deceiver long since vanquished. The 4th dimension has been the crux of more confusion than words could express, the relationships between the material and immaterial, the seers, the keepers, the guardians. The resonant “smoke” has been of such an enormous size, it was rather difficult to see beyond. To create beyond, it helps to see or sense “beyond”. If you can imagine all the lies and distortions surrounding money, for an easy example, as one giant cloud, it may be a little easier to decipher how it became possible that it has been so long covering the Sun, the Central Sun, and because that’s how things really work, the Truth of our Beingness. The waves have amplified in vibration once again and are being complemented by the power of the Blue Moon on March 31. This is exciting and it is important to remember how amazing it is to be alive at this time. We are here, together, as architects of light experiencing and blueprinting a major ascension process. What we are experiencing right now is something that many of us have lived lifetimes for and even thought it can hurt, it is incredible to be here at this time. Throughout the past weeks, I have been sharing a series of images that represent light code and galactic decrees. Together, they tell the story of the freedom of an order of truth tellers who had kept the codes for mass 12 strand dna and crystalline grid activation as part of their sacred duty (first image tells the story). This included beings like Venusian creators, Christ, the Order of the Magdalene, people connected to some (but not all) Angels of Atlantis, and many more who had endured incredible hardship and persecution as part of the carrying of the sacred truth: that all humans have divine capacity and potential which has lied dormant in their DNA. The subsequent balancing of this energy throughout the timelines has created space for the activation of the 12 strand dna potential in the masses to continue in accelerated fashion (for it had already began). This was and is a big deal, and it is a joy to share this news. If we look at our current energy situation, we are in the middle of a long corridor of constant acceleration, amplified bifurcation, and solar flares/CME activity that is off the charts. As we know, these conditions are the perfect action zone for us to be activated, upgraded, initiated, tested, and make leaps in our growth. For those who are working through their energy bodies and opening up their DNA potential, as well as awakening and/or expanding their senses. For many people, this experience which has included what you could experience as irregular energy experiences such as fatigue, radical change in diet, varied sensations of downloading and connecting, and in some cases even a direct knowledge of ‘rebuilding’ parts of your energy body. Even those of us with fully awakened energy systems are experiencing transition in these moments as we learn to live and operate in accordance to a much higher general vibrational frequency. The images following the decree share about strands of the incoming energy that have been stimulated as we have continued through Equinox alignment. season. As you scroll through them, take the time to connect in to them and allow them to become focale points of meditation, release, and growth. As I have shared this series over the past weeks, I have added explanations, exercises and interpretations with most images that are geared to support your connection with the energy. I will append those to each photo for you to review if you feel called. Which images you feel most called to are an indication of what is being worked on in your energy body. March 29 is 4 Kan / K’at. Stability, consistency, and balance is the order of the day today. The reason we, the human species, have been able to thrive for so many millennia is because Mama Earth has been cycling through a period of relative stability (as in, no super volcanoes, no asteroids, no planet-rending earthquakes) and because our native peoples knew how to work with and respect nature, not conquer or destroy her. But the global climate has begun to tilt dangerously, largely due to fossil fuel and other emissions, clear-cutting forests and polluting our oceans and rivers. Our rate of consumption of nature’s profound but not endless abundance has altered ecosystems, extinguished entire species, and is damaging our very own health and well-being. So let us honor the number four, Kan, coupled with its namesake day sign, Kan, and return, step by step, to that natural balance and stability. Imagine what would happen if every one of us did one little thing every day. If we all took a water bottle to work instead of the plastic ones. If we all passed on the pre-packaged food and cooked instead. If we all chose water over sugary drinks. If we all thought twice about buying that plastic toy/cutlery/container/whatever. The ancient Maya had no idea we’d come to this point… or did they? Regardless, the old core values this Tzolk’in day carries, still very much hold. Rebalance yourself today.